Safe Cycling | Bicycle Wagga Wagga Inc. Bicycle Wagga Wagga aims to promote cycling as a safe and responsible mode of transport. If you see something that is dangerous, or could potentially be that way, do not hesitate to contact Council. Don’t rely on someone else advising Council - do it yourself. Council cannot fix things they do not know about. It is better that they receive duplicate reports than to not receive any report at all. E-mail or ring the council. Be Safe! Be Smart! Be Seen! The 'Be Safe! Be Smart! Be Seen!' campaign aims to encourage cyclists to increase their safety level at all times but particularly during the darker winter months by thinking about what they wear. Cyclists are encouraged to wear light coloured clothing and to make use of reflective materials to enhance their visibility. The legal lighting requirements are also highlighted. 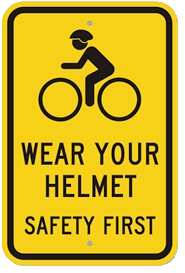 The campaign targets other road users by alerting them to the fact that they should be on the lookout for cyclists. Past campaigns have seen the use of radio and print media advertising. In addition a street banner has been prominently displayed. During one of the campaigns a reflective slap-band was produced and made available free of charge to cyclists through the local specialist bike shops. An information sheet was prepared and distributed with the slap-bands. 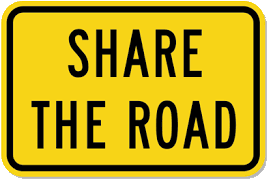 BWW contributed to the 'Share the Road' campaign facilitated by the Committee 4 Wagga. This campaign brought together interested parties including the cycling clubs, the local bike shops and other businesses and individuals that provided the funds to purchase 'Share the Road' signs which were installed by Wagga Wagga City Council on popular cycling routes. In addition, safety messages were developed which appeared in print and aired on radio and television. Some of these safety messages are used on this website. Also, car stickers were produced and distributed throughout the cycling community. BWW collaborated with other cycling clubs to develop a 'Keep Our Locals Safe' campaign which centred on the valuable community members that ride bikes. The message delivered was “You’ll never know, who you’ll run into on a bike”. Advertisements for television and radio were created and these were aired as Community Service Announcements. Two examples of the television advertisements can been seen on this website. A metre matters laws require drivers to give cyclists a minimum of 1 metre when passing a cyclist on roads with speed limits of up to and including 60 km/h, and a minimum of 1.5 metres for anything above that speed. A metre matters is simply about drivers not hitting cyclists. Cyclists are among our most vulnerable road users and need this space to keep them safe. 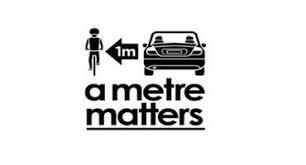 A metre matters also recommendation that cyclists allow 1 metre when passing pedestrians.